Every year Disney Nature brings amazing movies to show how beautiful our planet is. To celebrate upcoming Earth Day, new Disney movie Monkey Kingdom is about to hit theaters this spring across the globe. Starting April 17 join adventure of Maya, the clever and resourceful blonde-bobbed monkey in "Monkey Kingdom," Disneynature’s new feature film set among ancient ruins in the storied jungles of South Asia. Maya’s world is forever changed when she welcomes her son, Kip, into her complicated extended family. Like all families, Maya’s has more than its share of colourful personalities—and she’s determined to give her son a leg up in the world. When their longtime home at Castle Rock is taken over by powerful neighbouring monkeys, Maya's whole family retreats, and she uses her street smarts and ingenuity to uncover untapped resources amidst strange new creatures and unsettling surroundings. Ultimately, they will all have to work together to reclaim Castle Rock, where Maya can hopefully realize her dreams for her son’s future. Featuring a rich variety of characters, including a mischievous mongoose, simple-minded langur monkeys, predatory leopards and monitor lizards, "Monkey Kingdom" is narrated by Tina Fey ("30 Rock"), directed by Mark Linfield ("Chimpanzee," "Earth") and co-directed by Alastair Fothergill ("Chimpanzee," "Bears"). With music from award-winning composer Harry Gregson-Williams ("The Chronicles of Narnia: The Lion, the Witch and the Wardrobe," "Shrek" movies), Disneynature’s eighth True Life Adventure—the follow-up to 2014’s "Bears"—comes to theaters April 17, 2015. 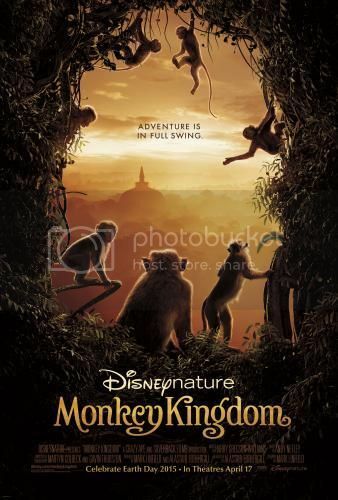 For our Canadian readers we are exited to give a chance to see Monkey Kingdom before it officially hits the big screen in three Canadian cities - Calgary, Toronto and Vancouver on Saturday, April 11th, 2015. For your chance simply fill the form below stating which city you would like to win tickets to. There will be three winner per city, each winner will get 2 passes (4 tickets). The giveaway is open to Canadian residents who can attend the select screening and ends April 7, 2015. Good Luck! I would love to take my son to see this movie in Toronto. I like to see this advanced screening in Vancouver Thanks! I love the last couple disney nature movies so would love to take my family to this one in Calgary. Calgary Please!!!!!!!!! Thanks for the contest.